In 2011 I collaborated with Mark Amstutz, professor of political science at Wheaton College, on an essay about public policy and the church. Although we were ultimately interested in broader questions about how the church should think about and speak to contested policy issues, we began by examining some recent church statements about immigration—concluding that they were not especially compelling. Not until a few months ago, however, did I discover that our short essay was for Amstutz only the beginning of a much longer and more intensive examination of the immigration issue in particular, an examination that has now culminated in a book, Just Immigration: American Policy in Christian Perspective, released by Eerdmans Publishing Company. We can be grateful that this issue captured Amstutz’s attention, because he has written the most thorough analysis of immigration policy to date from an explicitly Christian perspective. Given the prominence of immigration in our political debates over the past several years—from President Obama’s executive action to protect the so-called “Dreamers” to President Trump’s travel ban on certain migrants and calls for increased border security—the book could hardly be better timed. But it is also well timed in a broader sense. Twenty years ago, relatively little scholarly work had been done by political scientists or moral philosophers about the specifically ethical aspects of immigration. That has changed significantly over the past two decades. At the same time, immigration has become an issue upon which many church denominations have felt compelled to speak. The issue is thus ripe for reflection—the intellectual and moral questions at stake have become clearer, and religious organizations have staked out public positions on the matter. 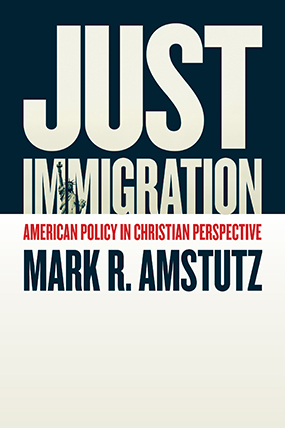 Amstutz’s book provides a valuable overview of these debates, one that should be of use not only to scholars and teachers but also to churches and citizens seeking greater clarity about the specifically religious implications of immigration policy. The book works on two levels. First, it is a careful policy analysis of a specific issue. It also involves second-order reflection on a more general question, the propriety of churches’ speaking to policy debates and the pitfalls they face in attempting to do so. At the first of these levels, Amstutz devotes two full chapters (roughly a quarter of the book) simply to describing America’s labyrinthine immigration system: the rules relating to how many people are admitted each year and according to what preference criteria, the different government agencies involved in making and enforcing policy, special issues related to refugee and asylee admissions, and the thorny problem of illegal immigration. Given the complexity of the system, his description of these issues is admirably clear and successfully lays the groundwork for his consideration of moral questions. Amstutz is similarly thorough when he turns to church statements on immigration, devoting a chapter each to Catholic, evangelical, and mainline Protestant denominational statements, giving careful attention to a number of documents from all three groups. I know of no more complete account of the denominational landscape with respect to immigration. 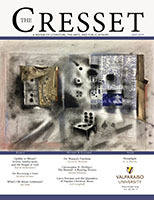 Amstutz frames the issue using a pair of competing theories of international order, which he labels “communitarian” and “cosmopolitan,” or in other places “realist” and “idealist.” Communitarians accept the existing order of sovereign states and regard the state as the primary actor in international relations. Without denying that states may have obligations extending beyond their borders, they view states as primarily responsible for the good of their own citizens. States, which are valuable as the chief institutional mechanisms for protecting human rights, are thus entitled (perhaps even have a duty) to regulate entry at their borders. Cosmopolitans, by contrast, view the world as a “coherent moral community” (109) and regard individuals as the key units in thinking about global justice. They are not inclined to attribute moral significance to sovereignty or to state borders, which often help perpetuate global inequality, and they have more confidence in international institutions. Because states have no inherent moral significance, and given the huge disparities in life chances accruing to people born in different countries, cosmopolitans find it difficult to justify restrictions on immigration. This communitarian/cosmopolitan distinction is a helpful way of framing competing positions on immigration. It involves some oversimplification, since one could identify a range of variations on either the communitarian or cosmopolitan theme. But as a way of capturing the two basic impulses that animate different approaches to immigration, it is entirely accurate. Opponents and proponents of immigration reform do indeed hold different views of the state and its moral significance, and attitudes toward immigration tend to align with attitudes toward related issues such as sovereignty, patriotism, or the importance of international organizations. 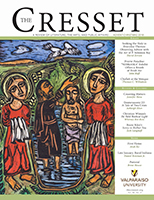 While Amstutz argues that a Christian ethic on immigration must combine insights from both perspectives—from the cosmopolitan a recognition of universal human dignity, from the communitarian an understanding that this dignity can be protected only by stable and healthy states—it is clear that his own sympathies lie chiefly with the communitarian view. He repeatedly criticizes moral philosophers and church officials alike for their failure to give sufficient weight to the world’s division into sovereign states, and he claims that any effective defense of human rights currently depends upon states. His hybrid view, which he labels “realistic idealism or global realism” (106), seems to me less of a hybrid than he implies. Indeed, I found myself wishing that Amstutz, instead of frequently merely asserting the existence of sovereign states as a fact that must be accepted for the foreseeable future, had offered a more forthright defense of communitarianism’s superiority over cosmopolitanism. Doing so might have prompted a deeper treatment of other assumptions that Amstutz appears to make without explicitly defending. For example, it gradually becomes clear that Amstutz regards amnesty for illegal aliens as extremely difficult to justify due to its corrosive effect on the rule of law. Thinking through the communitarian position more extensively, however, would complicate this assumption. Communitarians understand that immigration is, at its core, an instance of a more general ethical dilemma, the problem of special obligations. When we restrict entry by foreigners, we are putting the force of the state behind the interests of our own fellow members, prioritizing them over those of outsiders. Communitarians justify the state’s obligation to give preference to the needs of its own members in this way by appealing to the special duties we have toward those with whom we share the bonds of a common life. If this sharing in a common life is what justifies immigration restrictions, however, it becomes difficult to deny illegal aliens access to citizenship indefinitely, because over time they too inevitably come to share in that same common life. The very same principle that justifies immigration restrictions, in other words—the communitarian recognition of special duties toward our fellow members—also generates the claim to amnesty for aliens who have spent some significant amount of time among us. Amstutz also appears to think, without explicitly saying so, that we ought to give greater weight to the claims of refugees than we currently do, given our system’s strong preference for family reunification, and to a lesser extent economic considerations, in determining whom to admit. One can certainly make a compelling argument to this effect, and I myself have argued elsewhere that the claims to admission on the part of those we might call “truly desperate” are very strong. At the same time, were we to recognize these claims more extensively, we could fill much of our entire quota for immigrant admissions with refugees, without ever even getting to family reunification or employment applicants. Amstutz does not seem to want to go that far. To stave off such a result, however, we need a robustly defended communitarian position, explaining why the right of current members to regulate admission is sufficiently compelling, at least much of the time, to override the very strong moral claims of refugees by admitting others instead. This disconnect between theological analysis and policy recommendations is revealing, because it suggests that many churches may actually be more interested in arguing for specific policy outcomes than in providing moral guidance to their members as they sort through the thorny issue of immigration. And here we arrive at Amstutz’s other concern, the broader question of how the church should approach public policy. Amstutz believes that the church should speak out on important issues, but he offers a number of cautions. Public witness requires thorough knowledge of policy and the workings of government, acknowledgement of actual political conditions (such as the division of the world into sovereign states), and a robust political theology. In particular, it requires churches to remain sensitive to the different roles of church and state or, to adopt characteristic Lutheran language, of the distinct roles of the heavenly and temporal kingdoms. Whereas states are chiefly responsible for establishing temporal justice, the church can offer its members moral education. Its most important influence on public policy comes not through its own direct intervention but through the many contributions of members who have been shaped by its teachings and who bring that witness to bear upon public issues through their many diverse callings. Amstutz offers few specific policy recommendations; indeed, one might have wished for more indications of what he himself takes to be the implications of his own analysis. Where his own views do become clear, it is less through open avowal than through the repetition of certain implicit assumptions (that amnesty undermines the rule of law; that refugees have weightier claims than other applicants do). He is presumably seeking to tread cautiously in this respect, perhaps not wanting those who disagree with his conclusions to reject the rest of his analysis for that reason. Still, he writes as a lay expert and not as a church representative, so he could take more specific positions without violating his own cautions to those speaking officially on behalf of a church. 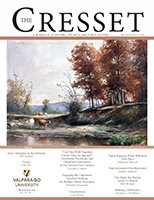 Even so, it is not a bad thing for readers to be given the thorough analysis that Amstutz has supplied and then invited to reach their own conclusions. A citizen who reads Amstutz’s detailed, fair, and thoughtful analysis will be in an excellent position to do just that—far better, alas, than one who has read only the typically less detailed, fair, or thoughtful analyses that so many of our churches have supplied on this issue.